Early in May, as spring rain deluged the car, I quickly lowered the window to snap one photo of a modest garage on 19th Avenue Northeast in Minneapolis, MN. Surely observers would have wondered what was notable about this particular garage. Well, nothing actually, but formerly it was the site of the Hermundslie family’s garage where Medtronic, now a leading multinational medical technology company, was born. Like more famous garages in Silicon Valley that begat Apple and Hewlett Packard, the former 800-square-foot garage (made out of two railway boxcars!) served as a convenient, no-rent location for brothers-in-law Palmer Hermundslie and Earl Bakken to found their company in 1949. Their primary business was servicing electrical medical equipment, earning manager Palmer and technician Earl a whopping $8 in revenue during their company’s first year. Inside the humble garage in 1957, Earl drew schematics on envelopes and grocery bags during an unbelievably short four-week development process of the first wearable, external, battery-powered transistorized pacemaker at the behest of Dr. C. Walton Lillehei, “the father of open-heart surgery” at the University of Minnesota’s Variety Heart Hospital. "[The] prototype, housed in aluminum and containing only two transistors, had been intended for tests with dogs but was used on human patients within days of its invention. Soon afterward, Bakken and his employees introduced a more refined version of the transistor pacemaker in a black plastic shell; about ten of these went into clinical use at the University. Later in 1958, Medtronic began manufacturing a commercial version in white plastic—the ‘5800’. All three versions were essentially identical in circuitry and other interior features." This was just the beginning, as Medtronic really boomed after purchasing rights in 1960 to produce and market the implantable pacemaker developed by and named for inventor Wilson Greatbatch and surgeon Dr. William Chardack. Earl Bakken working inside Medtronic garage, c 1955. Courtesy of Medtronic. Our garage drive-by was the first stop during a tour of Earl Bakken and Medtronic history-related sites courtesy of my expert guide, Dr. David Rhees, Executive Director of The Bakken Museum. David is a long-time advisor to the Museum’s Lemelson Center for the Study of Invention and Innovation where I work, and he was thrilled that we plan to feature Minneapolis/St. Paul, a.k.a. “Medical Alley,” in our Places of Invention exhibition. Since this case study highlights the invention of the wearable pacemaker by Earl Bakken, I was interested in learning more about key sites in Earl’s life and work as part of my research about Medical Alley. One of my favorite stories is about how young Earl (born in 1924) was inspired to become an electrical engineer after seeing Boris Karloff’s 1931 “Frankenstein” at the Heights Theatre on Central Avenue near his childhood home in Minneapolis. So in the pouring rain David drove me by Earl’s house and then on to the now-renovated theatre to take photos. He told me about how fun it was to help Earl celebrate his 85th birthday with a special screening of the 1931 movie there. Our next stop was at Medtronic’s world headquarters where Earl still maintains an office even though he is nominally retired and lives in Hawaii. I got a kick out of seeing two Frankenstein figures on his desk. 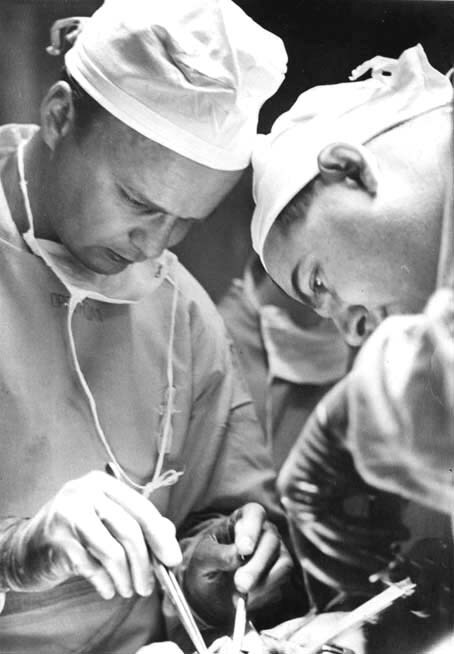 Dr. Lillehei in surgery with Dr. Varco, 1954. Courtesy of the University of Minnesota. Although my Places of Invention exhibition research has been focusing on the 1950s and 1960s and particularly this pacemaker invention story, I enjoy learning more about how Medical Alley, MN, has continued to grow and change as a hot spot for medical technology through today. Again, David proved to be an excellent guide, arranging a meeting with Dale Wahlstrom, President and CEO of LifeScience Alley (formerly Medical Alley, which merged with Minnesota’s Biotechnology Industry Organization in 2005), and his colleagues Liz Rammer and Ryan Baird, who shared information and insights into the “ecosystem” in Minnesota that continues to support and encourage invention and innovation. David also introduced me to Minnetronix staff, including President and CEO Rich Nazarian and Vice President for Corporate Affairs Jonathan Pierce, who were visiting The Bakken Museum that day, giving me the opportunity to ask them directly about what it is like living and working today in Medical Alley. Bakken pacemaker. Courtesy of The Bakken Museum. A key message that came through loud and clear during my tour with David and talks with others is that the medical industry in the Twin Cities was and is a “tight-knit community” that combines the “delivery and technology sides”  of medical innovation. While I continue to study its history, I look forward to keeping an eye on the future of Medical Alley, Minnesota and seeing what amazing new technologies may emerge from this fascinating place of invention. Rhees, David, and Kirk Jeffrey. 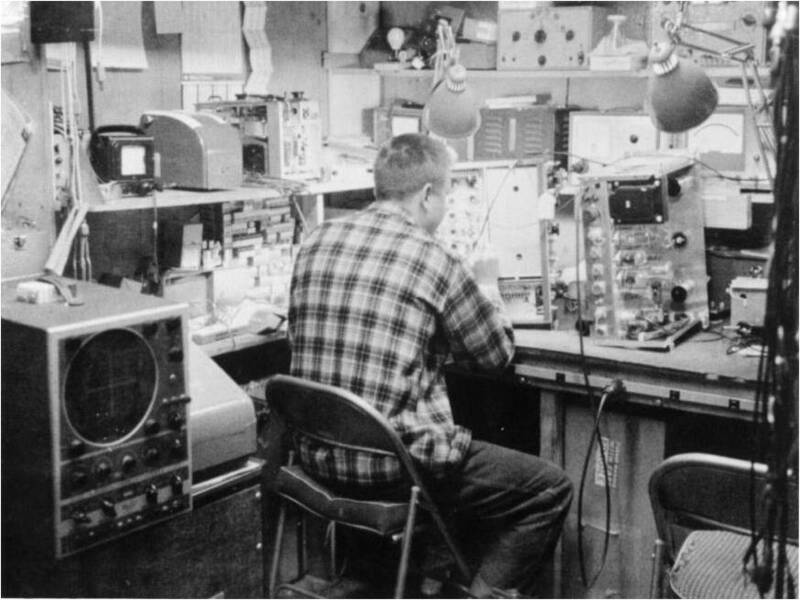 “Earl Bakken´s Little White Box: The Complex Meanings of the First Transistorized Pacing and Pacemaker.” In Exposing Electronics, edited by Bernard Finn. London: Harwood, 2000, p. 1.